What I learned from a local SEO client. Recently I had a local search optimization client (a locksmith company – I cannot divulge actual client name due to client privileges) tell me after 2 months into our local online business marketing she did not think it was paying off and wanted to quit. I was surprised and honestly felt bad. Was my performance less than excellent? Why did she feel this way? I had provided monthly updates and we spoke several times during the course of these 2 months and she never mentioned being unsatisfied with my work. Because it is critical to me that my clients get top notch results, I needed to know that her business did benefit from my local search optimization services. From day one I explained to her that the work preformed would probably appear in her second month reports and so on. It can take time for local directories to publish updates, time for citations to be discovered, time for other related tasks to appear online, time for Google to discover these new citations – listings etc. and thus time for her to actually see results within her monthly reports. Did I fail at local search optimization & local business marketing? I dug into her Google analytics to investigate. I knew what I would see but I wanted to see if I could figure out why she did not see any value.Â It has been about 3 weeks since she put a stop to her local search optimization. 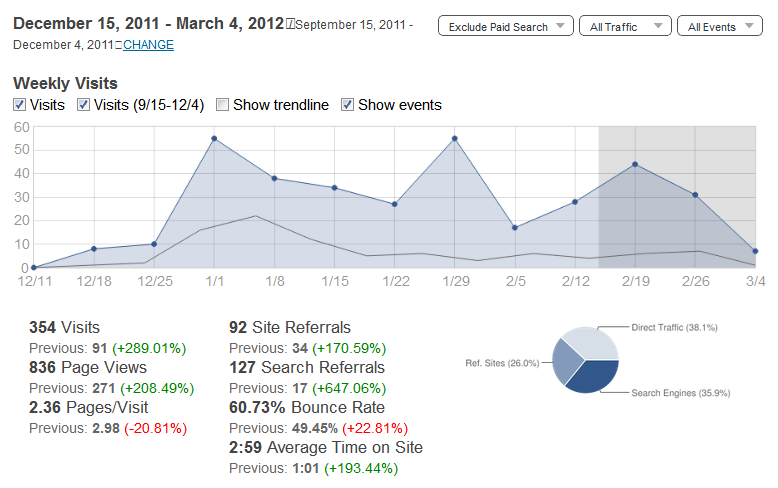 During the first month she gained 56 new visitors from organic website traffic an increase of nearly 95%. 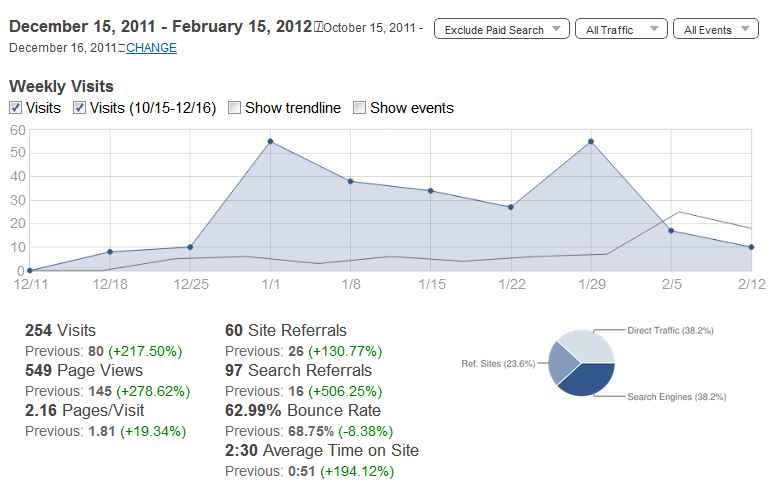 She paid $89 monthly for her local business marketing with SEOGoogleGuru.com. 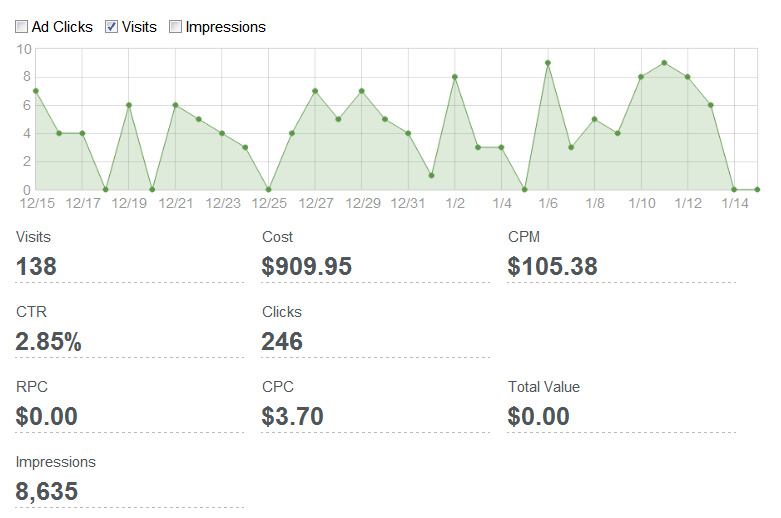 During this same period she paid $909.95 to Google Adwords for 138 website visitors. 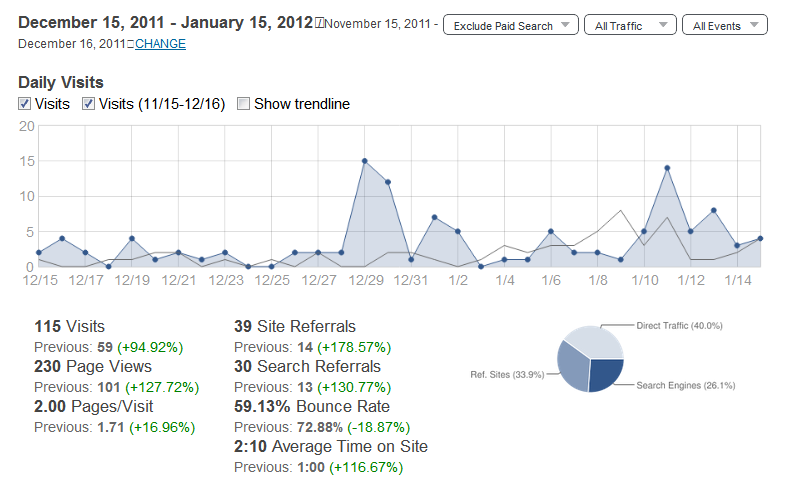 From Dec 15 to February 15 2012 she had gained a total of 171 new website visitors from organic website traffic. An increase of over 200% prior to my local search optimization. During this same period of time she paid $1883.07 to Google Adwords for 321 website visitors. Our campaign ended on February 15 2012. The total number of new organic visitors to her website from December 15 2011 to today (March 3rd) was 263 or nearly 300%. 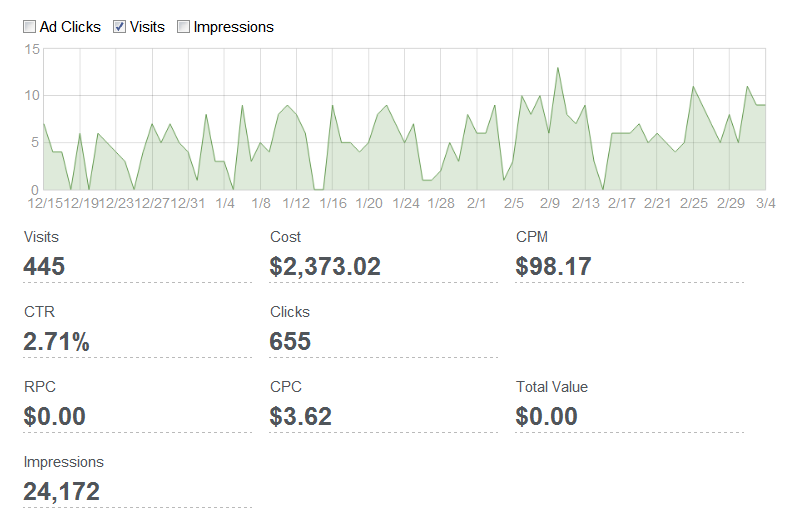 Meanwhile she continues to pay for Google Adwords and spent $2373.02 for 445 visitors. Did local search optimization benefit her local business marketing? She paid $89 monthly or a total of $178 for local search optimization with SEOGoogleGuru.com and received 263 new website visitors from this service. 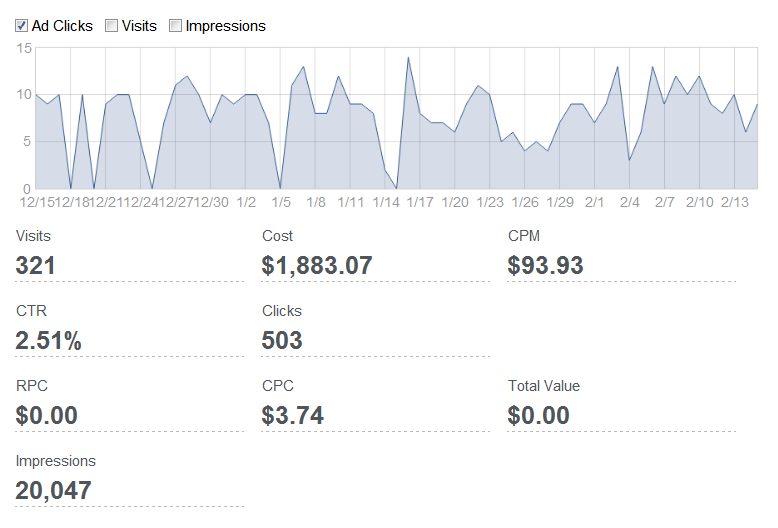 She paid $2373.02 for 445 visitors from Google Adwords. Based on the numbers above I am clearly say yes. Being listed in the search engines andÂ appearing in search results when someoneÂ searches for a local businessÂ can reduced financial out go to Google Adwords and increase organic traffic. I am not sure why my client decided to quit her local search optimization. Her explanation does not make sense to me. But I feel confident that my work did benefit her local business marketing. I can only imagine what these numbers might look like after one year if she had continued working with SEOGoogleGuru.com. Has local search optimization changed your local business marketing? I would love to hear your stories. Share them by commenting below.